1 packet Baking powder 3 tsp. 1 Soak the fruit in tea overnight then drain well. Line a loaf pan with baking parchment. Preheat the oven to 180°C/350°F with top and bottom heat. Beat the eggs with the sugar and salt until foamy. Mix the flour with the baking powder and apple pie spice and fold into the egg mixture. Fold in the drained fruit and spread the batter smoothly in the prepared pan. Bake in the preheated oven for about 1 hour. Then cover with aluminum foil to prevent the top from burning and bake for a further 30-45 minutes. 2 When done, let rest in the pan for 5 minutes, then turn out onto a cake rack. Brush with clear honey while still hot and let cool completely. 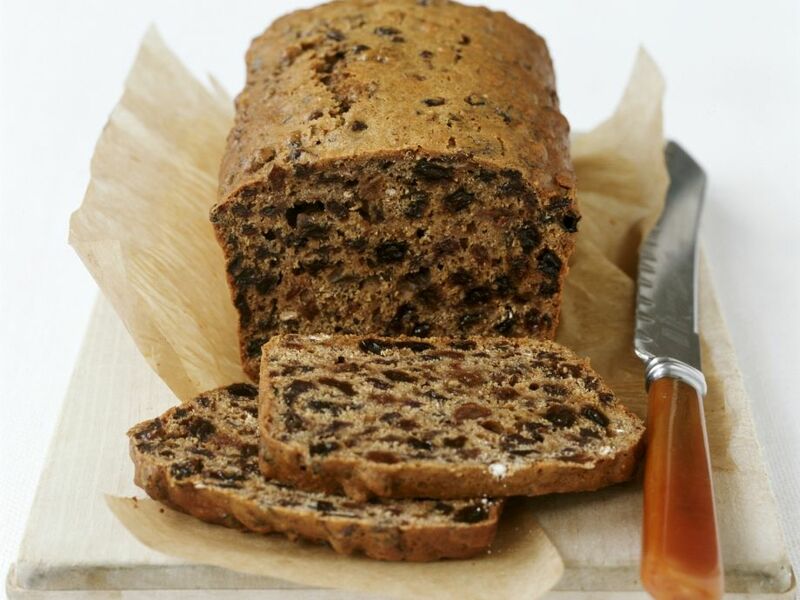 Nice fruit loaf but you need to sort out the ingredients on the first pagr. 1333 cups of rasins! 200 meters of tea! I suspect people dont go further than that.